1 Departamento de Farmacología, Centro de Investigación y de Estudios Avanzados del Instituto Politécnico Nacional (Cinvestav), México D.F. 2 Departamento de Química, Centro de Investigación y de Estudios Avanzados del Instituto Politécnico Nacional (Cinvestav), México D.F. En este estudio proporcionamos evidencia de la unión de la alfa-1- ácido glicoproteína (AAG) a Docetaxel como pieza clave para evaluar las formulaciones de diferentes fabricantes. La comparación de genéricos con el innovador es un campo activo en Farmacéutica. Si bien las pruebas de control de calidad se basan en la evaluación del fármaco activo, nuestros resultados muestran que la unión a proteínas y los excipientes (Polisorbato 80) también juegan un papel crítico. Diseñamos un ensayo por espectroscopia de absorción electrónica para evaluar la unión de Docetaxel a la AAG y la influencia del Polisorbato 80. Evaluamos genéricos de Docetaxel de India y América Latina, nuestros resultados muestran que algunos genéricos de Docetaxel no coinciden con el innovador. El ensayo aquí desarrollado es una técnica factible y de fácil acceso que podría implementarse como una exploración rápida del control de calidad de genéricos de Docetaxel disponibles en todo el mundo. In this study we provide evidence of the alpha-1-acid glycoprotein (AAG) binding to Docetaxel as a key assay to evaluate formulations from different manufactures. The comparison of generics to the innovator is an active field in Pharmaceutics. While quality control tests are based on the evaluation of the active drug, our results show protein binding and excipients (Polysorbate 80) also play a critical role. We designed an assay by electronic absorption spectroscopy to evaluate the Docetaxel binding to AAG and the influence of Polysorbate 80. We evaluated Docetaxel generics from India and Latin America, our results show some generics of Docetaxel do not match with the innovator. The assay here developed is a feasible and easy access technique that could be implemented as a quick scan of quality control of Docetaxel generics available worldwide. Docetaxel (N-debenzoyl-N-tert-butoxycarbonyl-10-deeacetyl taxol) is a lipophilic semi-synthetic antineoplastic drug of the taxane family. Docetaxel is obtained from 10-diacetyl baccatin III which is an extract from the tree Yew Taxus baccata. Docetaxel inhibits cell division and promotes apoptosis by binding to tubulin. Docetaxel is used for colorectal, breast, ovary, prostate, lung, endometrium, stomach, head and neck cancer 1),(2),(3),(4),(5),(6),(7),(8. Docetaxel was developed by Sanofi-Aventis under the name of Taxotere® and the patent expired in 2010 in the EU and 2013 in US 9. This has caused the launching of generic formulations, which require the implementation of tests for their quality. Quality control of Docetaxel after synthesis involves testing as X-ray diffraction, infrared spectroscopy, calorimetry and nuclear magnetic resonance. Once in formulation, Docetaxel is stored in a glass vial with nitrogen atmosphere and continue with the stability of the drug. Docetaxel is stable at 40±2 °C and 25±2 °C for 6 months and 36 months, respectively. Additionally, Docetaxel formulation is tested by visual examination, identification of the active ingredient and impurities by High pressure liquid chromatography (HPLC) 10),(11. However, Docetaxel quality control is complicated because the effects of antineoplastic agents cannot be studied in healthy individuals as required by the Phase I, bioequivalence tests. Therefore, it is necessary to design methods in vitro to provide information on the properties of a Docetaxel formulation. In the formulation, Docetaxel is accompanied by the vehicle polysorbate 80, which is crucial for the encapsulation and subsequent release of the drug 12. The polysorbate 80 is a hydrophilic surfactant, polyoxyethylated non-ionic and it is approved for internal use because of its low toxicity, low hemolytic activity and because it is mild to the skin and it maintains the physiological pH. The polysorbate 80 is used to emulsify and disperse the drugs, alter the fluidity of the membrane increasing its permeability and promotes Docetaxel encapsulation in the form of micelles, altering its pharmacokinetics 3), (6), (7), (12),(13),(14),(15. In the pharmacokinetics of Docetaxel, the stages of release and binding to plasma proteins are essential to reduce the adverse effects of Docetaxel16, such as neutropenia. Neutropenia is a condition where there are an abnormally low number of neutrophils in the blood, and it is caused by Docetaxel molecules that are not bound to plasma proteins. The only way to identify a toxic dose of Docetaxel is to perform a neutrophil count after administration of the drug; if the patient has less than 1500 neutrophils/mm3, dose adjustments or the suspension of the antineoplastic are recommended 1. The most important plasma proteins in binding and distribution of drugs are albumin and alpha-1-acid glycoprotein (AAG). Albumin is not a selective carrier and has a number of relatively large binding sites, where many drugs with similar physicochemical characteristics can bind 17. Human serum albumin (HSA) is the most abundant plasma protein in the bloodstream, therefore is responsible for maintaining the oncotic pressure. HSA has a high affinity for a wide range of endogenous and exogenous compounds; the latter ones being mostly xenobiotics such as drugs. Endogenously, HSA binds: metals such as copper and zinc, fatty acids, amino acids, metabolites such as bilirubin and hormones 18),(19),(20. The concentration of HSA in a healthy individual is 696 µM, however, some conditions may decrease the concentration to 550 µM 5. HSA deficiency can be caused by liver cirrhosis, nephrotic syndrome, malnutrition, increased catabolism as a result of tissue damage or inflammation and/or genetic diseases 5. HSA is a protein from a single polypeptide chain consisting of 585 amino acids, 17 disulfide bonds, a molecular weight of about 66,500 Da, its half-life in the blood stream is 19 days and its affinity constant for drugs is tipically in the order of 104 to 106 M-1 (20,21,22. HSA has a predominantly alpha-helix folding, with three homologous domains (I, II and III), where each domain consists of two subdomains (A and B) connected by flexible loops. HSA has 2 major binding sites located on subdomains IIa and IIIa 19), (20), (22. Binding sites for drugs are also able to bind endogenous ligands. The binding specificity of each site is determined by its shape and distribution of basic and polar residues in the hydrophobic interior walls 23. On the other hand, AAG also called orosomucoid, is a protein of 183 amino acids, has 2 disulfide bonds and 5 N-glycosylated sites 22. The folding of AAG consists of 8 sheets forming a beta barrel flanked by an alpha-helix and 4 loops connecting beta-sheets 24. AAG is soluble in water and organic solvents, it is a protein of low isoelectric point (pI = 2.8-3.8) and high carbohydrate content (≈ 45%) 25), (26. The concentration of AAG in a healthy individual is 17.5 µM, whereas concentrations in cancer patients are 30 µM. Hepatic syntheses of AAG increases under certain stimuli such as physical trauma, bacterial infection and inflammatory stimuli. Although the exact role of AAG is still unknown, it is considered a natural anti-inflammatory agent and immunoregulatory, having the ability to link basic drugs and other molecules like steroid hormones. AAG is involved in the process of coagulation and tissue repair 5), (26), (27, and reduces the local or remote injury after intestinal ischemia in a rat model 28. The binding sites of AAG for endogenous and exogenous ligands have not been elucidated, although it is proposed that AAG has a binding site with different regions that are amenable to bind acidic, basic and neutral drugs. Histidine 97 of the AAG is involved in the binding of acidic drugs, tryptophan 122 in the binding of progesterone (neutral drugs) and tryptophan 160 binds basic drugs 22. The effect of the vehicle is a determining factor in the adverse effects of Docetaxel. The concentration of polysorbate 80 has an important impact on the concentration of free Docetaxel in the bloodstream mainly because of the binding to plasmatic proteins 12), (29), (30. Albeit some studies have shown the characterization of Docetaxel to HSA31), (32, AAG could be the main determinant in Docetaxel plasmatic protein variability 5), (12), (16. Thus, AAG is an acute phase protein often elevated during chronic inflammation and advanced cancer. The pharmacokinetics of Docetaxel and thereby its toxicity, could be related to the great inter-individual differences in the AAG levels24 and the fraction unbound16. Although Docetaxel is highly used for cancer treatment in different generic forms, it does not follow traditional bioequivalence in the quality control testing. This study evaluates the use of different spectroscopic techniques, mass spectrometry and microscopy as tools to probe Docetaxel binding to plasma proteins. The test here developed with electronic absorption spectroscopy shows that AAG and polysorbate 80 are main factors to evaluate Docetaxel generics. The interaction of Docetaxel (Taxotere presentation) with HSA and AAG was evaluated by spectroscopic, spectrometric and microscopy techniques. Fig. 1A shows the electronic absorption spectra of Docetaxel in increasing concentrations (4, 8, 12, 16, 20, 24 and 28 µM), and the spectra of HSA in the absence and presence of Docetaxel (4-28 µM). In order to evaluate the changes in the HSA spectrum upon addition of Docetaxel, the spectrum of Docetaxel was subtracted from the HSA-Docetaxel spectrum, as showed in fig. 1B. The results revealed a change in the wavelength of maximum absorption of 2±1 nm and a decrease in absorbance intensity. The change of absorbance at 234 nm as a function of the concentration of Docetaxel is expressed by dA/dD (A= Absorbance, D=Docetaxel). Upon addition of Docetaxel to HSA the dA/dD obtained was de -18,031 ± 4,522 M-1 (32. Fig. 1C shows the fluorescence emission spectra of HSA protein in the presence of increasing concentrations of Docetaxel (1-7 µM). The fluorescence emission spectrum of HSA presents a slight shift in the wavelength of maximum emission and small changes in the intensity of fluorescence upon addition of Docetaxel. Fig. 1D shows the CD spectra of HSA in the absence and presence of Docetaxel. The HSA, having a secondary structure rich in alpha-helix shows two negative bands: one at 210 nm and another at 220 nm. The HSA maintains its alpha-helix secondary structure even in the presence of Docetaxel, regardless of the protein-drug ratio. Fig. 1E shows the MALDI spectra of HSA with Docetaxel, where a peak at 67,258.9766 a.m.u. (atomic mass units) can be observed. The mass gain is attributed to the binding of Docetaxel formulation. We also obtained the HSA mass spectrum, where the presence of a peak at 66,477.8594 u.m.a.is consistent with the molecular weight of HSA (66,478 Da). Also, we observed the Docetaxel-polysorbate 80 micelles in presence of HSA after 30 days of preparation by TEM. The micelles have different diameters as they have a tendency to form clusters (fig. 1F). After 60 days of preparation, the micelles are broken and do not form clusters (fig. 1G). Fig. 1 Characterization of Docetaxel binding to HSA by spectroscopy, spectrometry and microscopy. A) UV-Vis electronic absorption spectra of HSA in presence of Docetaxel. Spectra of: increasing concentrations of Docetaxel (4, 8, 12, 16, 20, 24 and 28 µM), dotted lines (a ̶ ̶ >g, respectively); HSA (2 µM), solid line (h); HSA in presence of increasing concentrations of Docetaxel (4-28 µM), solid lines (i ̶̶ ̶>o, respectively). 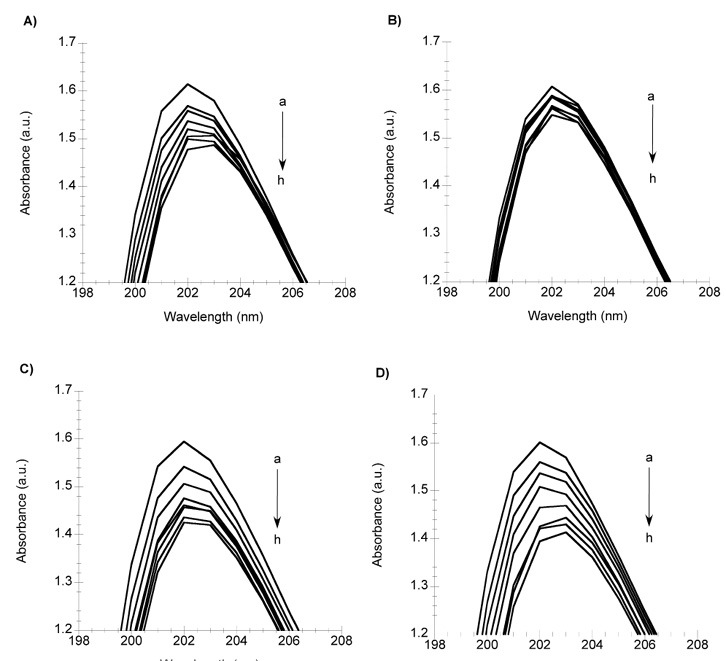 B)Difference absorption spectra of HSA (a=2 µM) in the presence of increasing concentrations of Docetaxel (4-28 µM), (b ̶̶>h, respectively). C)Fluorescence emission spectra of HSA (a=2µM) in the presence of increasing concentrations of Docetaxel (1-7µM), (b ̶̶>h, respectively). D)Circular dichroism spectrum of HSA (-) 2µM in presence of Docetaxel (-□-)12 µM, (-◊-) 24µM and (-Δ-) 36 µM. For panels B), C), and D), the corresponding spectrum of Docetaxel was subtracted from each spectrum of HSA with Docetaxel. E) MALDI-TOF spectra of HSA (2µM) in presence of Docetaxel (4µM). F) TEM image of HSA (2 µM) with Docetaxel (4 µM) after 30 days of preparation. G) TEM image of HSA (2 µM) with Docetaxel (4 µM) after 60 days of preparation. In panels F) and G), the scale bar corresponds to 100 nm. The evaluation of Docetaxel binding to HSA by spectroscopy, spectrometric and microscopy techniques is useful to obtain different information of this phenomenon. Though, electronic absorption spectroscopy provides the most sensible, easy and reproducible technique to evaluate Docetaxel binding. Thus, we used electronic absorption to study Docetaxel binding to AAG. To understand the behavior of AAG in the presence of Docetaxel, fig. 2A shows the spectra of AAG with Docetaxel in increasing concentrations of 4 to 28 µM. The spectrum of the drug was subtracted from each spectrum of the protein in the presence of Docetaxel, and the resulting spectra are shown in fig. 2B. AAG has an absorption maximum at 207 ± 1 nm with a molar extinction coefficient of 1,084,880 ± 34,240 M-1cm-1. Upon addition of Docetaxel to AAG, a shift in the wavelength of maximum absorption of 2 ± 1 nm and a decrease in absorbance were observed (fig. 2B). The change in absorbance with respect to the concentration of Docetaxel is -15,671 ± 2,306, this ratio is termed dA/dD, where dA is the change in the absorbance a 234 nm and dD is the change in the concentration of Docetaxel. The standard deviation is associated to the error from 5 different experiments. Fig. 2 Electronic absorption spectra in the UV-Vis region of AAG in presence of Docetaxel. 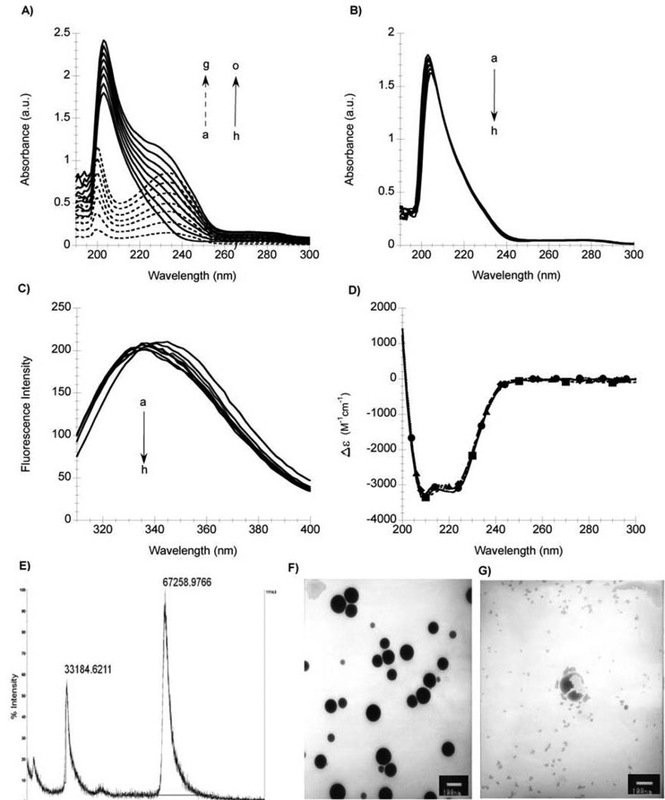 A) Spectra of: increasing concentrations of Docetaxel (4, 8, 12, 16, 20, 24 and 28 µM), dotted lines (a ̶ ̶ >g, respectively); AAG (2 µM), solid line (h); AAG in presence of increasing concentrations of Docetaxel (4-28 µM), solid lines (i ̶̶ ̶>o, respectively). B) Difference absorption spectra of AAG (a=2 µM) in the presence of increasing concentrations of Docetaxel subtracted by the corresponding spectrum of the drug (4-28 µM), (b ̶>h, respectively). The ratio dA/dD that represents the binding of Docetaxel to HSA and AAG could be useful as an indicator of the quality of the formulation. In order to validate this ratio, we evaluated different batches of Taxotere. Table 1 shows the batches of Taxotere analyzed by electronic absorption spectroscopy. Figures 3A and 3B show the molar extinction coefficients (ε) of Taxotere at 200 and 234 nm, respectively. These results show that all batches match the extinction coefficient of Docetaxel, as specified. The evaluation of Docetaxel binding to HSA and AAG using different batches of Taxotere is shown in fig. 3C and 3D, expressed as dA/dD. Batch 1 represents the units used to adjust the experimental conditions. 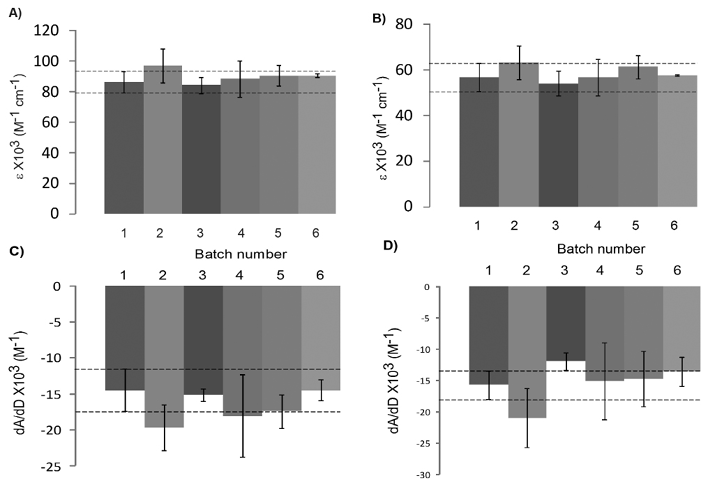 These results show that most batches display the same HSA and AAG binding features, except batch number 3 that is in the inferior limit of the range established for dA/dD for Taxotere-AAG binding. These findings suggest that Docetaxel binding to AAG could be more sensitive and specific than HSA by electronic absorption spectroscopy, in agreement with Urien et al by ultrafiltration 5. Our test does not need patients and it is cost efficient and less time consuming than assays currently available. Table 1 Batches of Taxotere analyzed by electronic absorption. Fig. 3 Electronic absorption study of 6 batches of Taxotere. Comparison of the molar extinction coefficients at A) 200 nm and B) 234 nm. Comparison of the binding capacity for C) HSA and D) AAG, expressed as dA/dD, where dA is the change in the absorbance a 234 nm upon addition of Docetaxel and dD is the change in the concentration of Docetaxel. Dotted lines represent the interval of the units in batch 1, which were used to adjust the experimental conditions. Error bars include the independent measurements of the different units. To deconvolute the contributions of Docetaxel and polysorbate 80 to the absorption spectrum of Taxotere, we measured the absorption spectra of the active drug, Docetaxel (fig. 4A) and the absorption spectra of the vehicle, polysorbate 80 (fig. 4B). The wavelengths of maxima absorption are a 200 and 234 nm. The sum of the absorption spectra of the active drug and the vehicle results in the absorption spectra shown in fig. 4C. We also compared the absorption spectra and binding to HSA and AAG proteins of the raw materials used by Sanofi-Aventis and those sold by Sigma-Aldrich. No differences in the molar extinction coefficients of Docetaxel and polysorbate 80, nor in the protein binding capacity were observed (data not shown). Fig. 4 Electronic absorption spectra of A) Docetaxel (a=4, b=8 c=12, d=16, e=20, f=24, g=28 µM), B) of polysorbate 80 (a=70, b=140 c=210, d=280, e=350, f=420, g=490 µM) and C) of Docetaxel+polysorbate 80 (a=4 µM Docetaxel+70 µM polysorbate 80, b=8 µM Docetaxel+140 µM polysorbate 80, c=12 µM Docetaxel+ 210 µM polysorbate 80, d=16 µM Docetaxel+280 µM polysorbate 80, e=20 µM Docetaxel+350 µM polysorbate 80, f=24 µM Docetaxel+420 µM polysorbate 80, g=28 µM Docetaxel+480 µM polysorbate 80). In order to study the effect of the vehicle (polysorbate 80) in the protein binding properties of Docetaxel, different formulations were prepared with different content of polysorbate 80 and the same concentration of Docetaxel. Fig. 5 shows the absorption spectra of AAG in the presence of Docetaxel with 0, 25, 50 and 100 % of polysorbate 80 (figures 5A, 5B, 5C and 5D, respectively). Even in the absence of polysorbate 80, Docetaxel binding is observed (fig. 5A). The binding of Docetaxel to AAG seems to decrease with 25 % of polysorbate 80, while it is recovered in formulations with 50 and 100 % of the vehicle (figures 5C and 5D). By varying the amount of polysorbate 80, the binding of Docetaxel to plasma proteins displays a non-linear behavior. Our results are consistent with Loos et al 12, where the binding of Docetaxel to HSA was assessed by equilibrium dialysis, finding that Docetaxel binding to human plasma proteins, and thus, the free fraction of Docetaxel in plasma, changes in a biphasic manner as a function of polysorbate 80. Fig. 5 Study of the effect of the vehicle of Docetaxel in the AAG (a=2 µM) protein binding assay, using: A) Docetaxel with 0% polysorbate 80, B) Docetaxel with 25% polysorbate 80, C) Docetaxel with 50% polysorbate 80, and D) Docetaxel with 100% polysorbate 80. In all cases the concentration of Docetaxel were: b=4, c=8, d=12, e=16, f=20, g=24, h=28 µM. The Docetaxel content and the binding to AAG was assessed in generic formulations from different companies and compared to results obtained with Taxotere. Generic formulations were obtained from different countries of Latin America. Table 2 shows the information of the generic Docetaxel drugs analyzed by electronic absorption spectroscopy and HPLC. Table 2 Generics of Docetaxel analyzed by electronic absorption spectroscopy and HPLC. To determine the Docetaxel content of each formulation, the chromatographic method was validated in linearity, precision and accuracy. The calibration curve was found to be linear from 4 to 18 µg/ml, we obtained a r and r² greater than 0.999. Table 3 shows the precision and accuracy results. Table 3 Precision and accuracy results of the HPLC valid method. According to the chromatographic results of Docetaxel content, Generic 1 and 5 have a lower content of Docetaxel (< 90 %). Additionally, Generic 1 contains impurities that became evident in the chromatogram (fig. 6). Our results are in agreement with a study in 2008, where 31 Docetaxel generics marketed in Latin America, Asia, Africa and Middle East were evaluated. 21 of them have less than the 90% of Docetaxel content and 23 have more than 3% of impurities by HPLC 2. Such studies underscore the importance of analyzing and evaluating generic formulations, as clinical consequences could be present in patients receiving a lower dose of Docetaxel than expected and the possible effect of impurities. Fig. 6 Comparative chromatogram of Taxotere and Generic 1 formulations. Figures 7A and 7B show the comparison of molar extinction coefficients at 200 and 234 nm for all formulations. 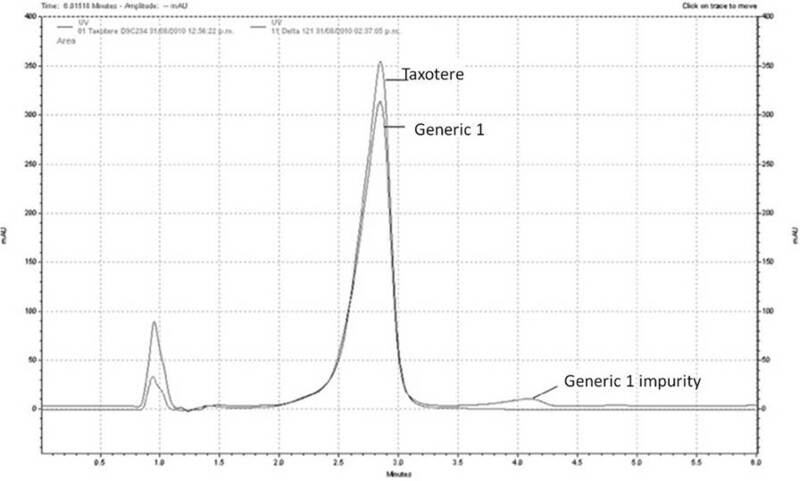 The results reveal that Generics 1, 3 and 4 display molar extinction coefficients that are larger than those established for Taxotere, implying that these formulations may contain impurities that contribute to their absorption spectra: this is certainly the case of Generic 1, as determined by HPLC. Fig. 7C shows the comparison of Docetaxel binding to AAG in all formulations. Generics 3, 4 and 6 do not match the AAG binding properties (dA/dD) as established for Taxotere, while Generics 5 and 2 show large intra-batch variations, highlighting the importance of pharmaceutical technology. In the case of Generics 3 and 4, this is consistent with the results of their molar extinction coefficients, suggesting that the impurities in these formulations may interfere with the binding of Docetaxel to AAG. On the other hand, Generic 6 displays low AAG binding in spite of having good molar extinction coefficients and an adequate content of Docetaxel. In this case, the low AAG binding may be reflecting a different composition of the vehicle or formulation, which has been shown to play a role in Docetaxel-protein binding. Although these results are not conclusive regarding the quality of the generics analyzed here, they illustrate the importance of using other analytical probes beyond HPLC. Fig. 7 Electronic absorption study of Taxotere and the generic drugs listed in Table 3. Comparison of the molar extinction coefficients at A) 200 nm and B) 234 nm. C) Comparison of the AAG binding capacity of Taxotere and generics. dA/dD is the change in the absorbance at 234 nm (dA) as a ratio of the change in the concentration of Docetaxel (dD). Dotted lines represent the interval of Taxotere. Error bars include the independent measurements of the different units. Our research expands previous studies of Docetaxel binding to HSA 31), (32, as we include AAG in the evaluation of the effect of polysorbate 80 in drug-protein interactions of Docetaxel as raw material and in formulations marketed in Latin America. We also highlight the importance of performing comparative analysis of Docetaxel generics to the innovator by a feasible and easy access technique such as electronic absorption spectroscopy. Here we studied 6 generic formulations of Docetaxel marketed in different countries of Latin America. The comparison of molar extinction coefficients at 200 and 234 nm shows that Generics 1, 3 and 4 do not meet the established intervals for molar extinction coefficients for Taxotere. A comparison of the binding of Docetaxel to AAG using the generic formulations shows that two of them do not meet the standards established for Taxotere. Large intra-batch differences could also be detected in some cases. Additionally, HPLC analysis of generic drugs showed that some of them contain impurities and less Docetaxel content than Taxotere. This study proposes the evaluation of Docetaxel binding to AAG by electronic absorption spectroscopy as a quick screening for quality control of Docetaxel formulations available all over the world. Docetaxel was used in the Taxotere presentation and its generic drugs (80 mg). In all cases, the drug is provided with two vials: one containing Docetaxel in polysorbate 80 and the other one contains 13% ethanol. Both vials were mixed and the spectrum obtained immediately after sample preparation. The samples were stored at 4 °C and protected from light. All batches and formulations of Docetaxel were within shelf life in the moment of analysis. Electronic absorption spectra in the UV-Visible region were measured from 190 to 300 nm, collecting data every 1 nm, using an Agilent 8453 UV-Visible spectrophotometer. For all experiments, the concentration of Docetaxel was varied from 4 to 28 µM. For experiments with pure Docetaxel (01885, Sigma-Aldrich), Docetaxel was dissolved in ethanol 100% (4-28 µM) and polysorbate 80 (MKBD1574, Sigma-Aldrich) in ethanol 13% in concentrations in the 70 to 490 µM range. For experiments to evaluate the effect of vehicle, the formulations used were 0%, 25%, 50% and 100% of polysorbate 80, where 100% of polysorbate 80 refers to the concentration of polysorbate 80 used in the experiments of Taxotere. All vehicle formulations have the same concentration of Docetaxel. Albumin serum (HSA, A1887, Sigma-Aldrich) and alpha-1-acid glycoprotein (AAG, G9885, Sigma-Aldrich) protein solutions with final concentration 2 µM were prepared in Phosphate Buffer Saline (PBS), pH=7.4. All measurements were done in quartz cell Sprectrosil grade and a path length of 0.5 cm. Fluorescence emission spectra were measured from 300 to 400 nm with an excitation λ= 295 nm and a scan speed of 240 nm/min, using a Varian, Cary Eclipse fluorometer. The concentration of Docetaxel (Taxotere presentation) was from 1 to 7 µM and the concentration of human serum albumin (HSA, A1887, Sigma-Aldrich) was 2 µM and was dissolved in Phosphate Buffer Saline (PBS) pH=7.4. A Sprectrosil grade quartz cell with an optical path length of 1 cm was used. Electronic circular dichroism spectra were measured every 2 nm, from 190 nm to 300 nm, with a scan rate of 50 nm/min and a bandwidth of 5 nm. The concentration of Docetaxel (Taxotere presentation) was varied from 12, 24, 36 to 48 µM and the concentration of HSA was 2 µM dissolved in Phosphate Buffer Saline (PBS) pH=7.4. A Jasco 815 spectropolarimeter and a optical Sprectrosil grade quartz cell with a path length of 0.1 cm were used. MALDI data of HSA in the absence and presence of Docetaxel were collected using a MALDI TOF/TOF 4800 plus analyzer (Applied Biosystems/MDS SCIEX). The matrix used was 2,5-dihydroxybenzoic acid (DHB) 20 mg/mL, and laser intensity was 5000 V. A stock solution was prepared with Taxotere formulation of Docetaxel 4 µM (Docetaxel MW= 861.3783). The HSA solution was prepared at a concentration of 2 µM and dissolved in MilliQ water (HSA MW= 66,478 Da). Docetaxel (Taxotere presentation) micelles were observed using a transmission electronic microscope JEOL 2000 EX/FX, 30 days and 60 days after preparation. Docetaxel 4 µM in presence of HSA 2µM were dissolved in MilliQ water, using 0.1 % of fosfotungstic acid pH=7.2 and copper grids. A volume of 10 µL of sample was placed on the grid, then 10 µL of fosfotungstic acid were added and incubated for 2 min, the grid was dried carefully with filter paper and observed under the microscope. The content of Docetaxel in Taxotere and generic formulations was determined by HPLC. A C18 Xterra MS (4.6 X 100 mm) column (Waters, Mexico) was used at 40ºC. The mobile phase was a mixture of acetonitrile:water (50:50) (HPLC grade) adjusted to pH 5.5 with acetic acid (J.T. Baker). The injection volume was 100 µL. The flow was 1 mL/min and the absorbance detector was set to 234 nm. For the calibration curve, a stock solution of Docetaxel (Sigma-Aldrich) 40 µg/mL was prepared using polysorbate 80/ethanol 13% (1/14) (Sigma-Aldrich, HPLC grade). Ethanol solution was previously acidified with acetic acid to 0.03%. The calibration curve consisted of serial dilutions to achieve five different concentrations of Docetaxel (4 to 18 µg/mL). Mycophenolic acid (Sigma-Aldrich) 6 µg/mL was used as internal control. The quality control samples consisted of serial dilutions to achieve Docetaxel concentrations of 8, 12 and 16 µg/mL. For the determination of the Docetaxel content of Taxotere and the generics, the samples were prepared with care, such as not to generate bubbles, and they were diluted (1:100) with ethanol 13% and acetic acid 0.05%. A LaChrom Elite HPLC System from Hitachi with autosampler and UV detector was used. The chromatographic method was validated in linearity, precision and accuracy. This work has been supported by Conacyt (scholarship to M.M., and grant # 128255 to L.Q.) and we are grateful to Sanofi-Aventis for providing Taxotere units and their corresponding raw materials. We thank Lorena Ramirez (Unit of genomic, proteomic and metabolomic, Cinvestav) for her assistance with MALDI, Lourdes Rojas (Unit of microscopy, Cinvestav) for assistance with TEM, Rodrigo González for assistance with HPLC and Gabina Dionisio for technical support.